Nearly all of us have seen an email so great that we clicked through to learn more, even if it was marketing a product we weren’t previously interested in… but we had to do it, because that email was crazy genius! Standing in the consumer’s shoes, wouldn’t it be great to get more emails like that? Even in 2017, it still seems that relevant emails are a dime a dozen. Even our favorite brands sometimes seem to send us products and offers that we just aren’t interested in. That leads me to the two main reasons that retailers and FMCG brands turn to loyalty program providers, to set up a rewards program of their own. First and foremost there’s a desire to get customers back on the site and shopping. In order to aid those efforts, there’s also a need to get more data to personalize existing email campaigns in a way that makes newsletters much less, well, forgettable. As someone who has worked to help numerous clients set up their loyalty programs, I think that emails and loyalty programs should not be thought of as separate entities, but rather a combined force. And it’s easy, if you think about it. Emails and loyalty program marketing have a lot in common. Both marketing tools need to strike a balance between stirring up curiosity and making really great offers. By combining them, you’ll give your customers greater incentive to get back online and buy. First, think about how you are currently dividing your customers up in your newsletter strategy. Whether it’s location, gender, app users vs. non-users, frequent buyers of an individual product category – maybe even the 60-days-since-last-purchase segment. If you only have three or four segments, based on less-than-unique data, like location or gender, you’re probably not giving yourself the opportunity to catch your customer’s eye. Basics like geographical location and will only get you so far. Once you’ve considered your current segmentation assets, start brainstorming segments that would help you get even more up close and personal. Ask your loyalty program provider how they can help you both get new data and reach new segments. Or reaching out to the segment of customers who recently connected their Facebook profile to the loyalty program. These types of actions help you learn more about your customer base, and act as a new segment for follow-ups. And they’re each another reason to send an email, letting them know about the opportunity to earn, asking how they’re enjoying the program, or just saying “thank you”. Think you can do it without a loyalty program? It won’t be too easy, because consumers expect something in return. 61% say they’d like loyalty points and rewards in return for handing over their personal data, and 61% of consumers also expect some type of discount or other special offer. 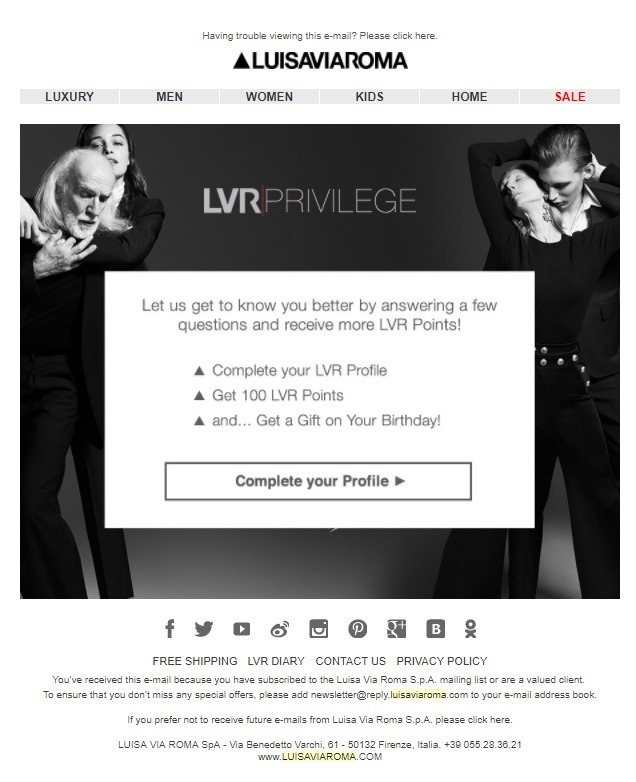 LuisaViaRoma sends great emails with eye-catching designs that let their loyal customers know how they can earn more, and what kind of benefits they can get their hands on. Communication is always key, but with a loyalty program, companies have many more reasons to reach out. It’s no secret that loyalty programs have been around for a while. On average, the number of loyalty programs that a consumer belongs is about 14. It’s also no secret that people tend to easily forget about their memberships. That means the bulk of the work for marketing pros is keeping the program fresh and relevant. …but also remember that most companies are using these already. You’ll increase your chances of making a great impression if you can build upon them. Don’t be afraid to think outside of the box. Consider the most unique parts of your loyalty program. Are you giving instant rewards for a particular action? Are you rewarding members for following your Twitter account? Whatever feature your program has that goes beyond a “standard” function, think of it as a reason to reach out to your customers. And if your margins allow it, include loyalty-related offers in your emails from time to time, so people will always be curious to see what’s included in your next newsletter. I always like to say that every single way a customer can earn points – or spend those points – is another great opportunity to get in touch with customers. If you’re currently planning a program and would like to get some inspiration on standing out from the crowd, I highly recommend this article on building trust and staying relevant in fashion retail. It shares some solid principles which can be applied across all industries. Columbia has loads of great loyalty emails. 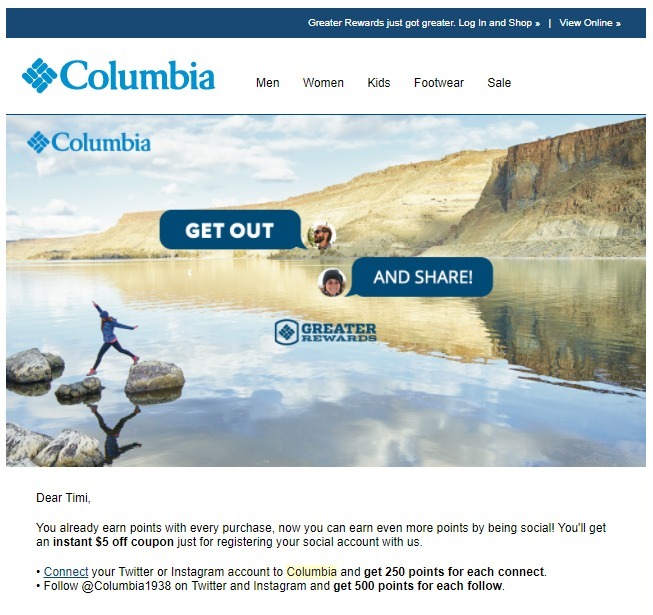 They really incorporate social media into the loyalty program, and use their emails to both inform customers about how they can earn points (above) and they’re not afraid to follow-through with a thank you, once a customer has connected. They concluded that “in periods before and after redeeming a reward, the customers purchase more than usual (both, they purchase more frequently and they tend to spend more per purchase) even when they are not ‘pressured’.” I highly recommend this study to anyone setting up a loyalty program, as it also speaks to whether or not the added pressures of point expiration truly work, but I digress. The important thing to remember is that rewards ARE your loyalty program. Even before becoming a member of your program, rewards are the motivator for your customers to sign up. And most importantly, the redemption process is what can change your customers’ attitudes toward your brand, creating true loyalty. Because email is undoubtedly one of the greatest ways to reach your audience, it is also one of the best ways to really advertise your rewards to your customers. 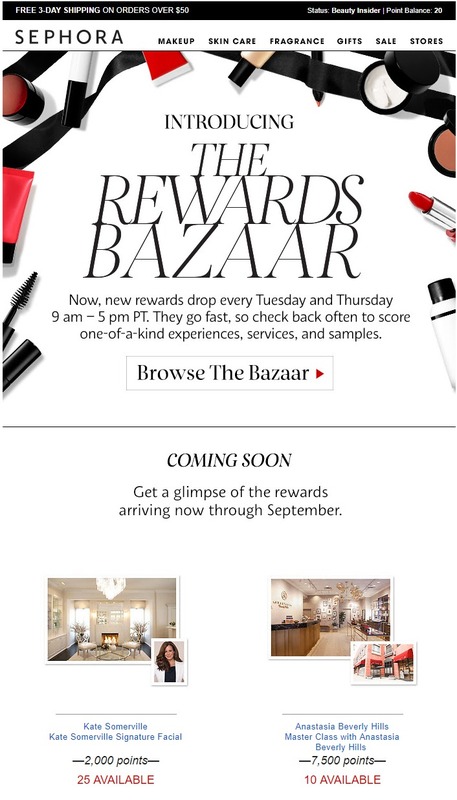 Think about the reward presentation in your email design. Really flaunt each valuable opportunity and create a sense of curiosity or excitement. A new reward is a great chance to motivate members to shop and engage, so they can earn more points – and spend them, too. Sephora always does an incredible job at highlighting their rewards. In fact, they’ve got running lists of rewards that are available, the quantity, and they even share which rewards are coming soon. You can read all about it in forums online: these emails get shoppers really excited. The data you get from a loyalty program is a great way to reach your customers more often, and in a more personal way. A loyalty program can render your email marketing strategy more successful, and there’s no doubt that emails will maximize the effectiveness of the loyalty program. These two marketing tools can combine to serve a great purpose: providing a more useful and memorable brand experience, which will build actual loyalty and give you a great boost in sales. So what are you waiting for?